(Bloomberg) -- CBS Corp.’s controlling shareholder said it was no longer interested in merging the media company with Viacom Inc., even before CBS filed a lawsuit to fend off a deal. Officials of a company owned by billionaire Sumner Redstone and his family told Viacom directors earlier this month that their interest had waned in merging the owner of MTV, Comedy Central and Paramount Studios with the U.S.’s most-watched TV network in prime time, according to a suit filed Tuesday by National Amusements Inc.
NAI didn’t “intend to force a CBS/Viacom merger, whether by removing and replacing CBS directors or otherwise,’’ NAI executives said in the Delaware Chancery Court suit. The court filings are the latest maneuvers in the battle over CBS, which pits Les Moonves, the company’s chief executive, against Shari Redstone, president president of NAI, which holds voting control of CBS and owns Viacom. She’s the daughter of billionaire Sumner Redstone. Shari Redstone asked the boards to explore a merger in late 2016, only to shelve the idea after meeting resistance. After waiting a little over a year, she pushed the companies to try again. 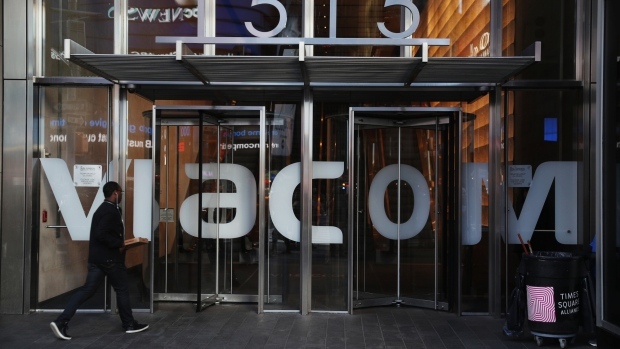 CBS directors said they decided a merger with Viacom wasn’t in the best interests of all shareholders and instead moved to dilute NAI’s voting control over the company. NIA’s countersuit claims CBS and its directors took “extraordinary, unjustified and unlawful actions” by voting to change corporate control and seeking to dilute the rights of Redstones. The seeks court order declaring a dilutive dividend approved on May 16 invalid. “The only cogent, but manifestly improper, explanation for the Director Defendants’ unprecedented action is that Leslie “Les” Moonves, CBS’s long-time CEO, has tired of having to deal with a stockholder with voting control and has taken particular umbrage that the exercise of such stockholder’s control has migrated from Sumner Redstone to his daughter, Ms. Redstone,” according to the suit. The case is CBS v. National Amusements Inc., No. 2018-0342, Delaware Chancery Court (Wilmington). --With assistance from Lucas Shaw.